This GROHE New Tempesta 100 head shower will turn your daily shower into a luxurious experience. With the GROHE Rain O², Rain, Jet and Massage spray, it offers four spray patterns to soothe and revitalize your skin. 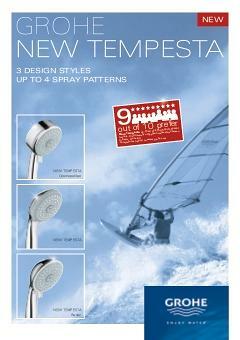 The GROHE DreamSpray technology ensures an even flow from all nozzles, for unparalleled comfort. Mounted on a ball joint with a swivel angle of +/- 15°, the head shower provides full coverage of your shower pan. Thanks to the GROHE EcoJoy system, your water consumption will never exceed 9.5 liters per minute, thus conserving precious natural resources and at the same time reducing your utility bill. With the durable GROHE StarLight chrome finish, this head shower will always be a dazzling eye-catcher in your bathroom, even after years of use. Our SpeedClean anti-lime system prevents any build-up of limescale.